Anghiari was a minor battle on June 29, 1440, in a series of otherwise all too common Florentine defeats as this commune spiraled toward the bottom in the years of the Italian Renaissance. As a subject, Florentine officials commissioned a painting of it for the city's Great Council Hall by the great artist Leonardo da Vinci. The commune had little else to commemorate. The Renaissance with its obsession with the ancient past grew up in Florence despite, not because of, chaos and deprivation. No battle and no painting saved the Renaissance or Florence. Niccolό Capponi writes that he provides here a history not of a sensational story of another lost and found work of the great Leonardo, as reported in "the domain of dilettantes or journalists, 'the pornographers of history.'" He discusses more important but uglier aspects of Renaissance Italy as portrayed in "the profound dynamics of Clio's world." Renaissance economics in the Italian city states/communes/republics created a mind numbingly complicated world of war paid for by heavy debts on the middle class to fund bonds. The government, church, and oligarchs were hugely corrupt. Banking, charity, taxes, and war were growth industries/rackets although not as much as in other parts of Europe. This place and time gave us Niccolo Machiavelli's classic work of political and social cynicism, The Prince. Critics can claim that it marked the beginning of the modern use of war for the profit to the benefit of the wealthy at a cost to everyone else. Copponi writes that Florence tried to have a permanent army, but mercenary bands led by "condottieri" were the order of the day. The mercenaries added to the misery with extortion, kidnapping, murder, robbery, and other "organized crime" that was sometimes rewarded with land and political power by the Italian political leadership. The author discusses how the huge loss in lives from battle encouraged advances in increasingly sophisticated developments in armor, horses, tactics, and weapons. Plagues and economic damage added to the horrors. The princes came to avoid battles that could go either way, however, instead applying slow, expensive economic pressure to bankrupt and starve an enemy. 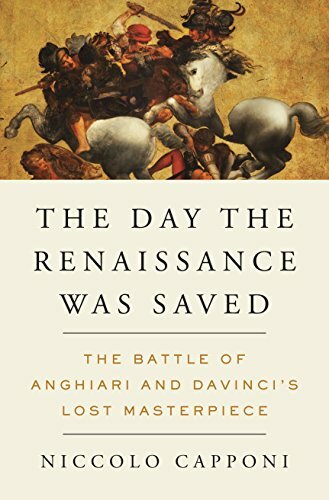 Most of The Day the Renaissance Was Saved is devoted to this history of the Italian city states and their battles. Relatively little space went to Leonardo da Vinci's mural of the battle despite recent unsuccessful efforts to prove that it still exists, perhaps covered up in part for political reasons. Capponi writes that having this renowned genius work on this project speaks most to the turmoil of the age. The Florentine government wanted the painting to reverse the declining public support for the commune's wars. The Florentine government also intended for it was to advance a political agenda. Leonardo worked on this project for over two years in the room where the great artists Bounarroti and Michelangelo had left their own respective projects abandoned after hardly more than sketches. This greatest mind of that time and maybe any other, took this commission below his usual fee. The author outlines complex personal reasons for the artist returning to Florence for this project about which he surely had reservations. Leonardo's notes show that the work was "imbued with religious and classical references" but also likely many hidden references to the ever-shifting politics and his own demons. The Battle of Anghiari, like so much of what Leonardo started, was never finished. A few sketches of it do survive. As with The Last Supper, the artist made a poor choice in using a deteriorating physical medium. The long ago battle depicted was between forces of Florence and Millan. Capponi writes that ironically a change in politics in those same two city-states determined that Leonardo would leave and never return to the project. For all the darkness of this history, the author writes of this tale as a huge theater of the absurd with sarcasm bordering on bombast and good humor. He admits from the beginning that some scholars, including friends, do not share all of his broad conclusions. Do not skip over the introduction, a casual but endearing and honest appraisal of how most of us see history (and with some memorable quotes). The book has appropriate illustrations including color pictures.